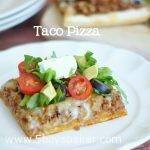 If you are in need of a quick, delicious and incredibly simple dinner, then this taco pizza is calling your name. 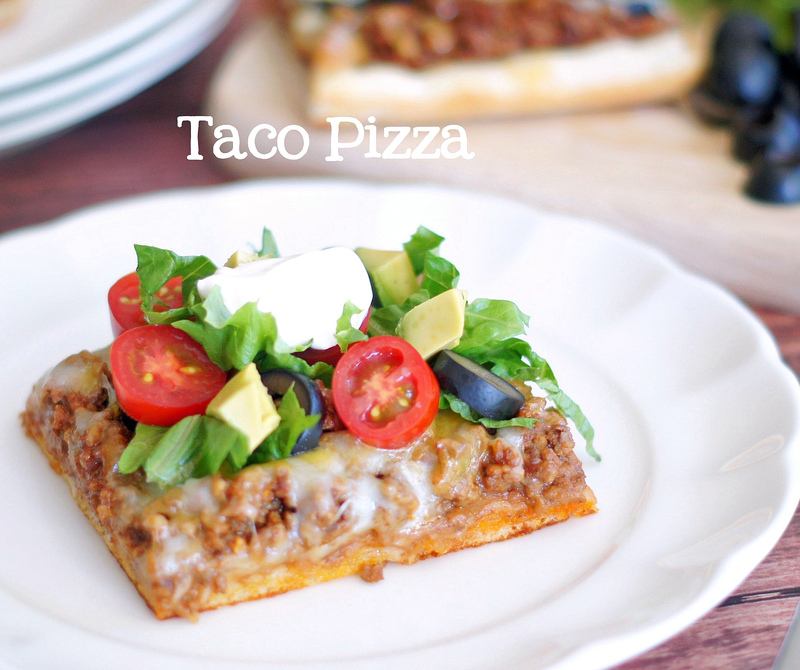 Who couldn’t love this . . .tacos and pizza combined – Yummo! This is what I consider a “safe meal,” meaning I’m 100% positive that everyone of my boys will eat it, there will be no complaints about “green stuff” and I won’t hear comments like “Ewww, what’s this?” Dinner is so much more enjoyable when everyone is happy and there is no teasing going on because they are all too busy eating. 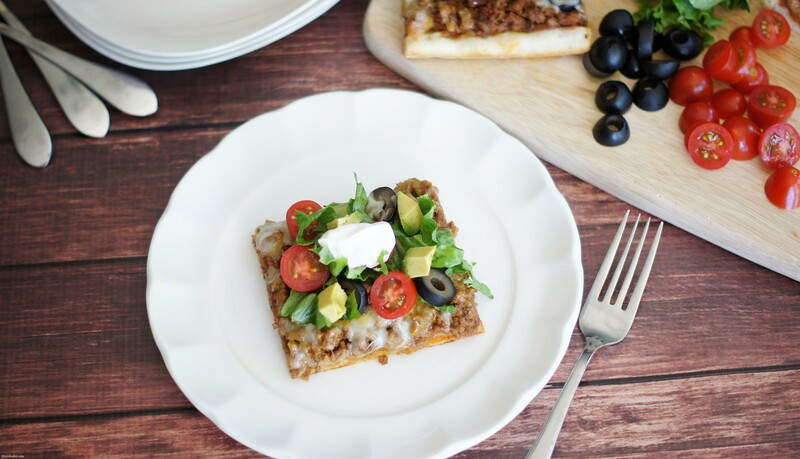 This taco pizza is a cinch to make. It can be gracing your table from start to finish in about 25 minutes. Spread some pizza dough into a pan, partially bake the crust, then top it with refried beans and then taco meat, pile on the cheese, bake it and then throw on whatever toppings your little heart desires. See what I mean, easy peasy. 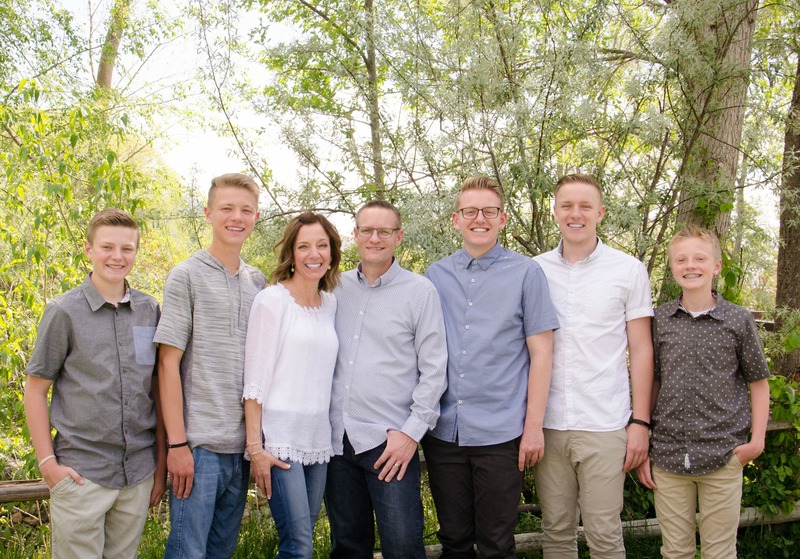 You will love, love this! I am taking a week off because we are headed on vacation, but I will be back soon with some great recipes to share. Sprinkle a 15 x 10 jelly roll pan with a little cornmeal. Press dough into pan and bake for 8 minutes. While dough is cooking, cook ground beef until no longer pink, drain grease and add taco seasoning and water. Stir until combined. Remove from heat. Empty refried beans into a microwave safe bowl and heat for about 1 minute. Remove from microwave and stir in 1 tsp. cumin. Spread refried beans over partially baked crust. Top with ground beef mixture and then top with cheese. Bake for 8 to 10 minutes or until edges of crust are golden brown and cheese is melted. Cut into squares and garnish with toppings.